Apple's market dominance ensured that the iPhone maker remained the largest consumer electronics brand for the second year in a row, NPD's Retail and Consumer tracking Services and Mobile Phone Track found. With year over year domestic sales growth of 36 percent, Apple's 19 percent of all sales dollars was almost twice as much as the second-place finisher, Hewlett-Packard. Total U.S. technology hardware and consumable sales fell one-half of a percent in 2011, finishing the year at nearly $144 billion. 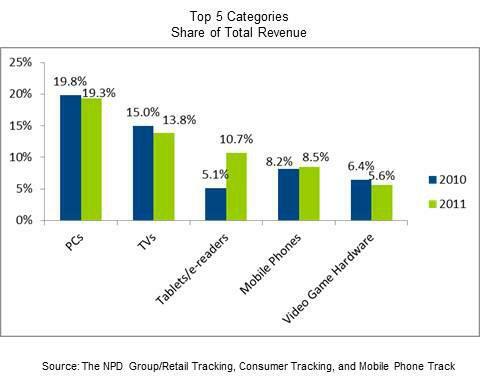 Nearly 60 percent of all sales were represented by the top five categories: PCs, TVs, tablets/e-readers, mobile phones, and video game hardware. "U.S. hardware sales growth is becoming harder and harder to achieve at the broad industry level," said Stephen Baker, vice president of industry analysis at NPD. "Sales outside of the top five categories fell by 8 percent in 2011 as consumers shifted spending from older technologies to a narrow range of products." Apple also had a strong showing among retailers, finishing in third only behind first-place Best Buy, and second-place Walmart. Staples and Amazon tied for fourth place, behind Apple, leaving the top five identical to how they were positioned in 2010. "While in-store sales fell about 2.5 percent in 2011, the growth in online volumes for retailers meant that retail name plates still accounted for well over four of every five dollars spent on CE hardware in the US," Baker said. "Despite their sales strength, retail stores still face serious challenges in 2012 as volumes in the traditional CE categories, which once carried these stores, continue to slide. It shouldnt be forgotten, however, that a large majority of mobile phones and tablets/e-readers (the two fastest growing CE categories) have mostly been driven through in-store experiences." The holiday quarter was Apple's best three-month period ever, as the company sold a record 37 million iPhones, along with 15 million iPads and 5.2 million Macs. Total revenue for the period was $46.33 billion, while earnings hit $13.06 billion.